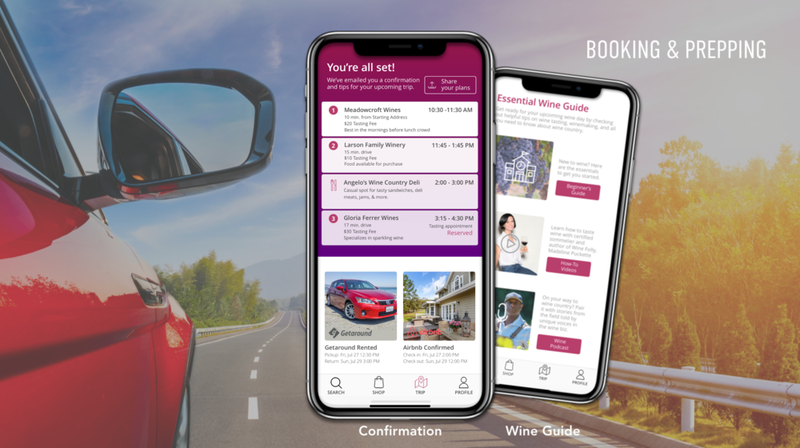 Swirl is an app that helps you plan your trip to California wine country, learn about wine, and connect you to the wine community. The wine tasting experience can seem inaccessible for some. The vast number of wineries in the area and lack of general wine knowledge for new visitors can make navigating the wine region and learning about wine overwhelming. How might we make wine more approachable for a more diverse audience by making it easier to learn and easier to access? Swirl reduces the stress and confusion from trip planning by enabling visitors to curate their search by tasting experience, location, reviews, and put together an informed itinerary. Select multiple wineries to create a full wine tasting itinerary and make reservations for tasting appointments, transportation, and lodging through the app. Access the Essential Wine Guide to learn about wine through blogs, how-to videos, and podcasts featuring female sommeliers, winemakers of color, and other diverse voices in the wine industry. Extend your trip beyond the wineries by purchasing wines through Swirl’s Wine Shop, visit local wine bars and restaurants in your city, and create your own wine tasting experience at home. My own wine journey started when I took a year off to live in Bologna, Italy, and studied Italian art and wine. My love for this communal, multi-sensory experience inspired me to introduce it to others. As an interaction designer, I saw an interesting space to solve user problems while also designing for delight and enjoyment. To design for a better wine tasting experience, I interviewed 15 wine consumers with novice to intermediate levels of wine knowledge and are occasionally visitors to Sonoma and Napa. I also spoke with 4 wine industry experts (a winemaker, winery owner, wine tour operator, wine business analyst) and attended an Airbnb Experience hosted by a winery to understand the consumer and winery perspectives. In mapping out the wine user journey, I discovered that visitors were most overwhelmed during trip planning and the most frustrated when they couldn’t understand wine terminology and explanations by wine staff. 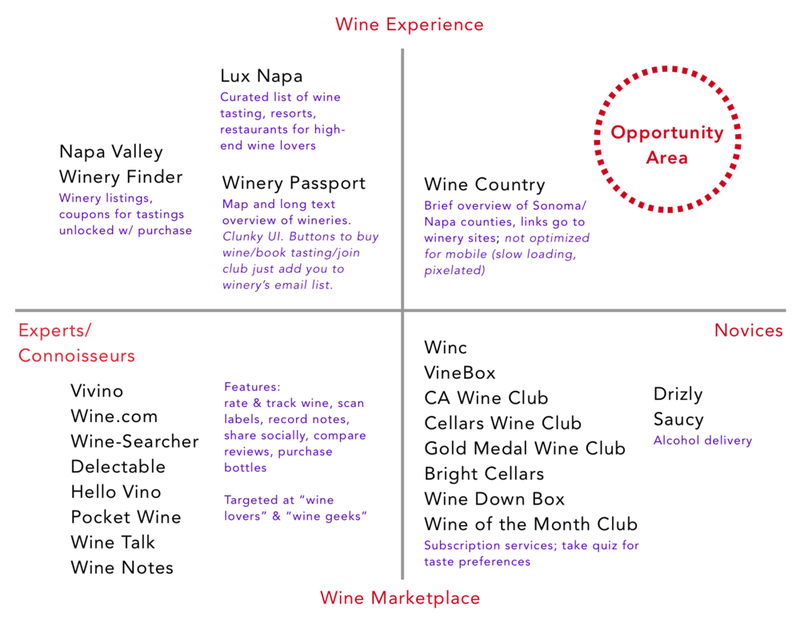 To understand if other products address users’ pain points in the wine experience, I researched and mapped competitors on a matrix. The wine marketplace is saturated with apps to sell and review wine, yet there are few services aimed at the wine trip experience. 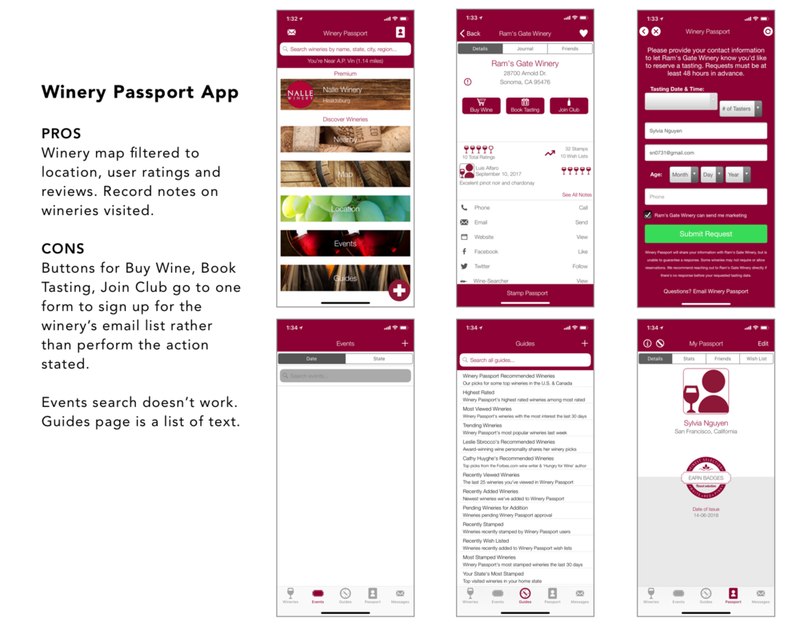 A deeper dive into some of the wine experience apps revealed some UX flaws. Too much information in a text-heavy format and redundant features made it harder rather than easier for users to figure out which wineries to visit. I saw the opportunity to design a better winery planning and educational experience. 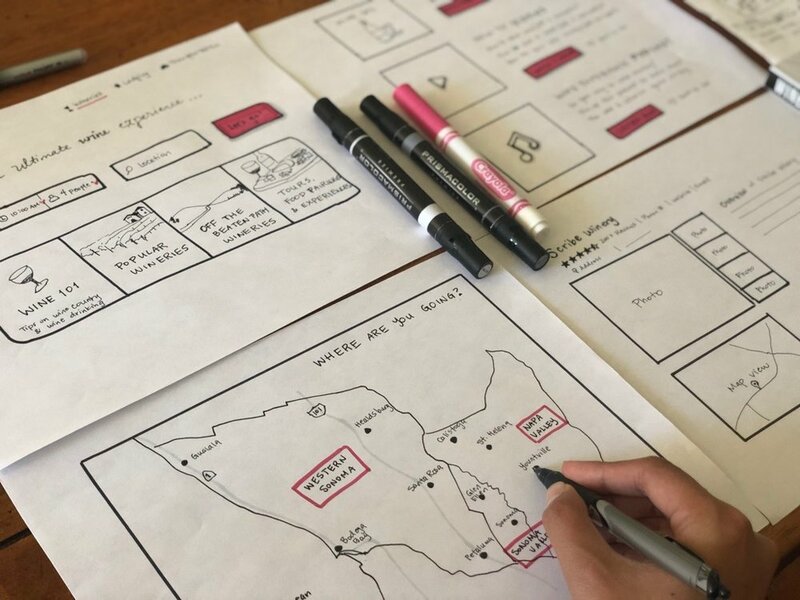 Before launching into digital designs, I first drafted low-fidelity wireframes and tested paper prototypes with users I interviewed. 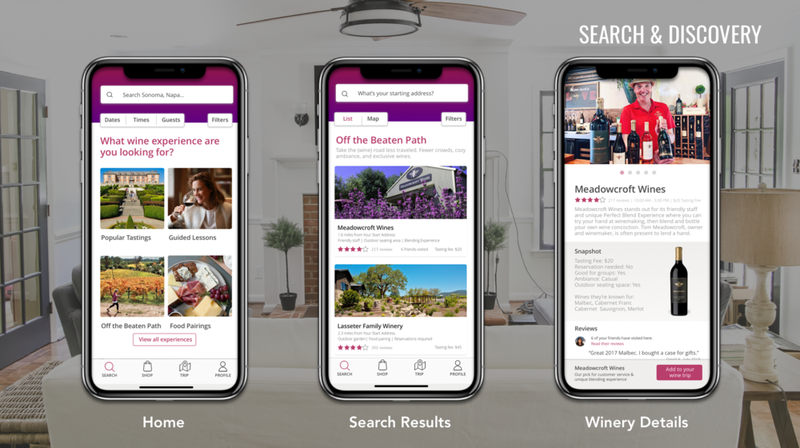 Consumers prioritized the winery ambiance, reviews from their social network, and reservation capabilities as the key features they wanted in a wine experience app. Wine industry professionals wanted to see business benefits in terms of the ability to market to consumers and sell more wine. While I couldn’t alter the tasting experience at an existing winery given the short time frame, I designed my own interactive experience to teach users how to learn and experience wine. I designed a Blind Aroma and Wine Tasting Test for an audience of novice to intermediate wine drinkers by using spices and ingredients commonly smelled in wine and researching tasting notes for regional varietals. User feedback from my prototyping sessions were incorporated into Swirl’s final key screens. Upon additional feedback from faculty advisors, I would also design a step-by-step onboarding flow to gauge wine knowledge and users’ preferences to create an even more approachable and understandable experience. The interactive Blind Aroma and Wine Tasting experience was a major high point for all the participants. I received a lot of positive feedback that it was a delightful and engaging way for users to learn about wine, hone their senses, and engage with one another. Many wish that wineries would offer a similar experience beyond just pouring and lecturing about wine.